■ A laparoscope with a 30° lens, because the angled lens facilitates direct videoscopic visualization during challenging portions of the procedure, such as splenic mobilization and hilar dissection. ■ A 5-mm curved tip Harmonic® scalpelb for the majority of the blunt and coarse pararenal dissection, including periarterial dissection. It allows for expeditious, safe dissection with excellent hemostasis. ■ Suction-irrigation device. Its tip can also be used as a blunt tip dissector for nonvascular tissue. Control of the major branches of the renal vein is achieved with titanium clips. The renal artery, renal vein and ureter are controlled with the Endo-GIA® linear stapler with a vascular load. Occasionally, the Endo-TAc linear stapler is used to achieve extra length on the renal hilar vessels. 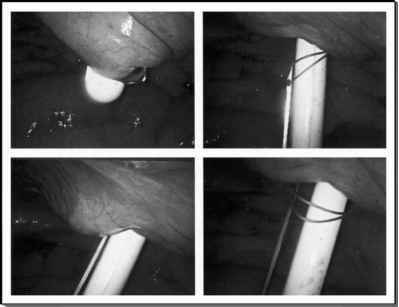 A 15-mm Endocatchc bag is used to entrap and deliver the renal allograft through the Pfannenstiel extraction incision. In addition to standard preoperative antibiotics, several medications are necessary to perform laparoscopic live donor nephrectomies and optimize immediate graft function. Each application will be discussed in detail during the comprehensive description of the operative technique. Mannitol is given on two occasions to help optimize renal perfusion. Anticoagulation is achieved with intravenous heparin prior to dividing the renal artery and then reversed with intravenous protamine prior to division of the renal vein. Topical papaverine is used to reduce arterial vasospasm during hilar dissection and allograft manipulation. Table 1 lists necessary and optional laparoscopic equipment for performing laparo-scopic live donor nephrectomies. A list of intraoperative medications is also supplied.